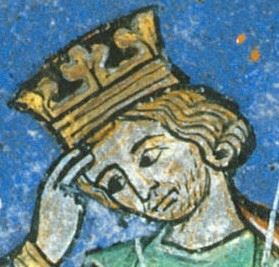 Fulk V, also known as Fulk the Younger, was the Count of Anjou from 1109 to 1129 and the King of Jerusalem from 1131 to his death. During his reign, the Kingdom of Jerusalem reached its largest territorial extent. He was originally an opponent of King Henry I of England and a supporter of King Louis VI of France, but in 1118 or 1119 he had allied with Henry when he arranged for his daughter Matilda to marry Henry's son and heir, William Adelin. Fulk went on crusade in 1119 or 1120, and became attached to the Knights Templar (Orderic Vitalis). He returned, late in 1121, after which he began to subsidize the Templars, maintaining two knights in the Holy Land for a year. In 1143, while the king and queen were in Acre, Fulk was killed in a hunting accident. His horse stumbled, fell, and Fulk's skull was crushed by the saddle, "and his brains gushed forth from both ears and nostrils", as William of Tyre describes. He was carried back to Acre, where he lay unconscious for three days before he died.